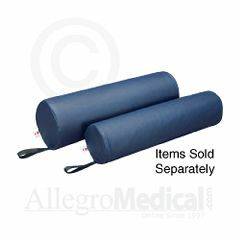 The Core Bolster is a durable aid for clinical treatment or home use. They provide support under the legs, arms, feet and other areas of the body during treatment. It is constructed from precision-cut, high-quality foam, and comes encased in an easy-to-clean vinyl cover. Selected colors are available.They are 24” in length, and heights of 6” and 8”. The 24” width is the same as most standard treatment tables, making this bolster easy to use with nearly all of your clients. The 24” bolsters come standard with a positioning strap making them easy to reposition. Straps are made of a heavy duty material so they will not tear, fray or wear out.